Grebes are diving birds that have adapted to life in and on the water over millions of years. All grebes (there are five genera worldwide) have highly reduced wings (especially during nesting season when they molt flight feathers). They often congregate in rafts and nest in colonies. Western grebe and Clark's grebe were once thought to be different color phases of the same species, and have only recently been determined to be different species of the same genus. Grebes spend almost their whole lives on the water and because of their adaptations to swimming, can barely walk on land. Their legs are far at the back of the body and provide poor balance. Grebes are much more graceful, agile, fast, and at home on the water, as seen in the video below. Grebes migrate from coastal waters in the spring to inland lakes for nesting. 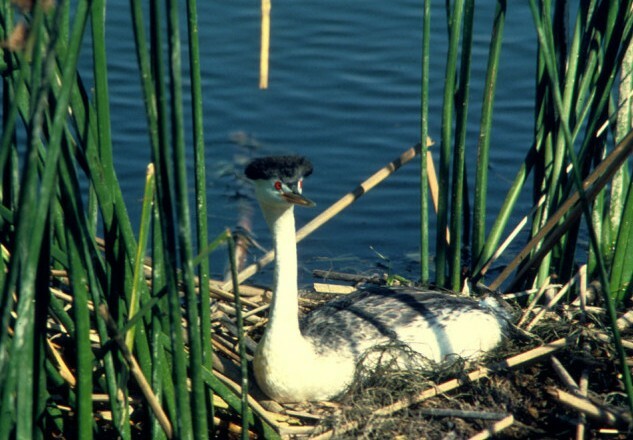 Lakes here in the Intermountain West support a large percentage of nesting grebes, and therefore were chosen for surveys to improve breeding conditions. Fall migration occurs sometime between October and December when grebes fly back to ocean habitats. Grebes engage in some of the most beautiful and complex courtship rituals of any birds. They swim together, displaying for each other in many different ways. This often involves presenting vegetation to each other, giving food to one another, and culminates with a rushing display. This is where both birds simultaneously raise up and run across the water side by side for up to 150 feet, then dive together. It can be seen locally or anywhere Aechmophorus grebes nest, as they always perform these and other ritualized courtship displays prior to and during nesting. See video to the right. Grebes build floating nests connected to emergent or submerged vegetation. These nests can be vulnerable, but are a compromise in adaptation. The nests can be stranded on dry land as water levels decline through the summer, especially on those lakes managed for power production or down stream rights. Western grebes dark portion up the back of the neck to the head comes below the red eye. The bill is a dull yellow-green to grayish. 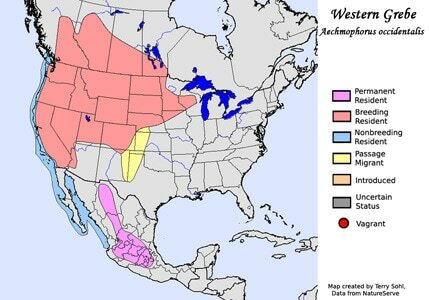 When compared with Clark's grebes, Westerns are darker overall and usually have two syllables in their call, with a relatively harsh and high pitch "cree-creet". These calls carry well across large bodies of water. 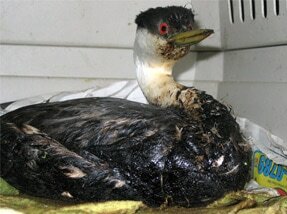 ​When on coastal waters in winter, grebes face different threats. These can consist of boat strikes, tangling in or consuming litter, and oil spills. This last threat, oil, is the primary reason the Grebe Project has been implemented. Grebes are one of the hardest hit species when oil spills occur on the ocean, as they are always on the water and must dive through floating oil. These birds can then lose their ability to thermoregulate due to wet feathers, or suffocate from oil entering airways.